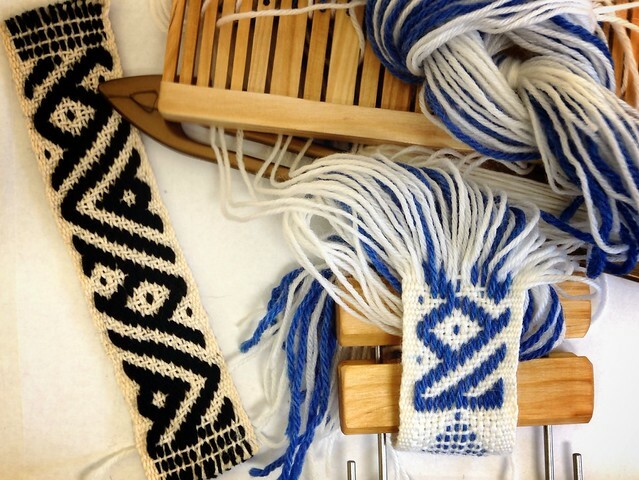 On the left is the sample I completed. After all that complaining, I realized it looks better off the loom than I thought it would, and I’m pleased with it, wavy selvedges and all. I’ve started a new one, all wool, and it’s also nice but doesn’t have the crispness that the cotton added. I altered the design somewhat so the bottom and top will match a little more. I’m thinking I can do several of these as bookmarks. Is it me? 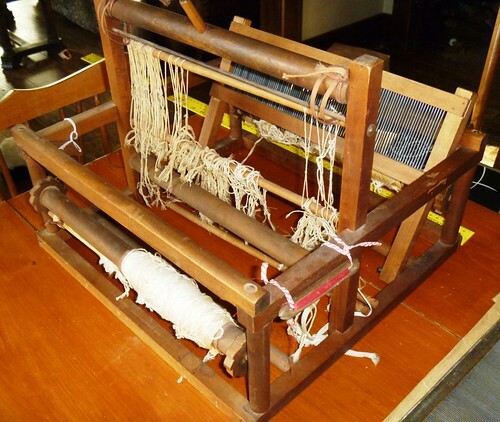 Is it the heddle? Or, is it the combination of materials? Probably a little of all three. I started an ambitious band design, something I found in the files of the Yahoo group, Bands and Braids. This design wasn’t charted, so I put it into a grid. Turns out it has 68 picks for one complete design… that’s a lot! You can see where I started and stopped and started again. I chose cotton for the background threads and wool for the pattern threads, and I found I had a similar problem to the previous band I completed: the cotton is saggier than the pliable wool, and that leads to tension problems. Plus, the wooden double-slotted heddle I bought has some snags here and there which are doing a number on the warp and it’s fraying quite a bit. 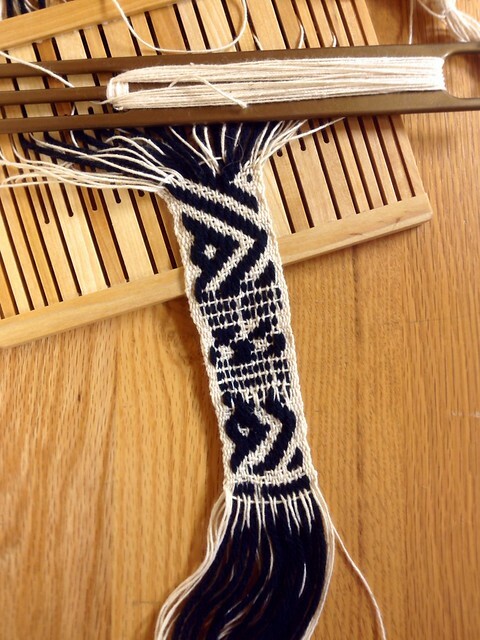 I’m not totally thrilled with the heddle, but I’m willing to sand down the slots, which should help; however, I’ve gone ahead and ordered two different sizes of double-slotted plastic heddles and a few other doo-dads from Stoorstalka. 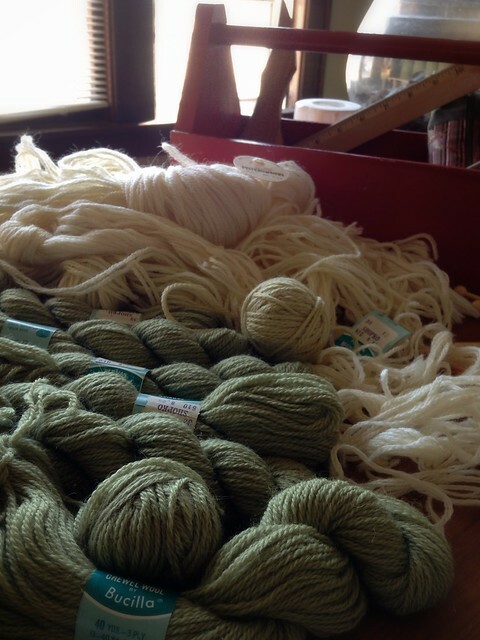 I’m anxious to try an all-wool band and set the cotton aside for awhile. I like the lacy and light feeling it adds, so I’ll use it again when I’m more experienced. 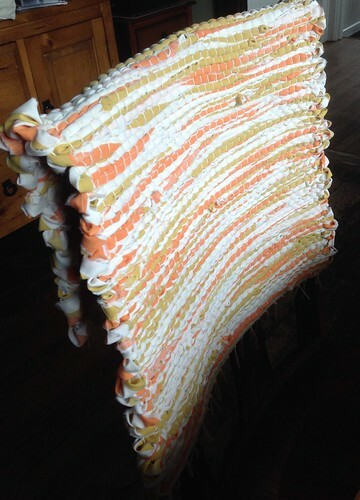 Cotton, with a Brooks Bouquet pattern, woven on the SampleIt loom. All done! This shawl is really light and warm. It measures about 17.5″x63″. I twisted the fringes with my new Leclerc gadget. This rustic Christmas tree looks nice both inside and outside the house on a wintry day. 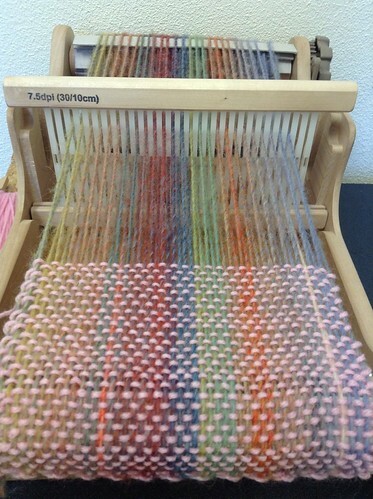 I wove it on the Glimakra Emilia loom using mostly cotton carpet warp. I used an inlay technique to create the tree. If I feel inspired, I may weave a few decorations, but I think I like it best as is. 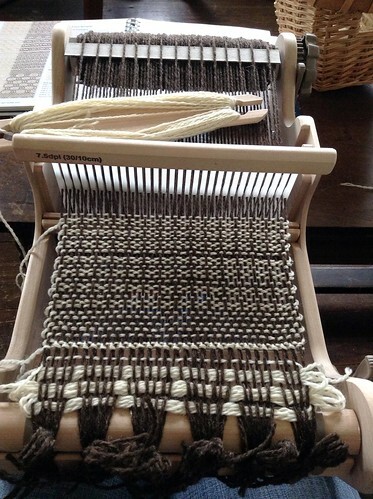 This is another plain weave scarf on the Ashford Sampleit rigid heddle loom. 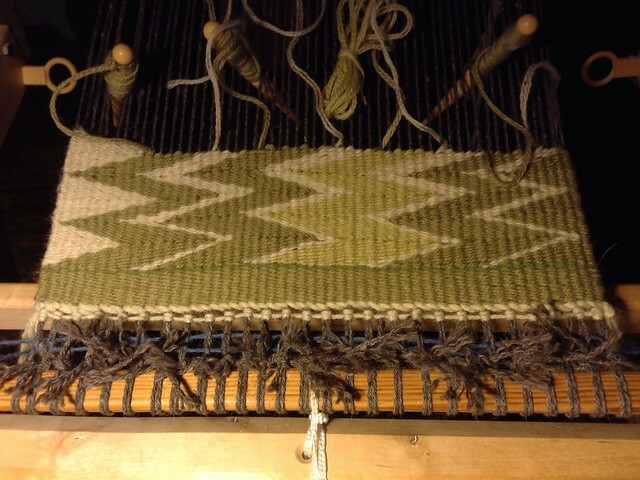 The warp is Lion Brand Amazing, which is 50% wool / 50% acrylic. It’s pretty, but it’s sticky. I bought three skeins thinking I’d make three scarves, but I may use it as a weft the next time around. 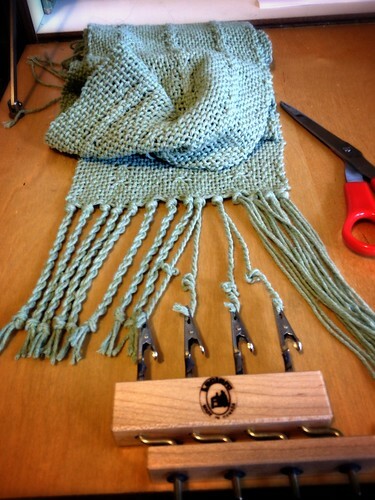 Makes me want to weave another scarf! Here’s a useful, soft, and warm scarf woven out of a single ply wool called Manos Maxima. 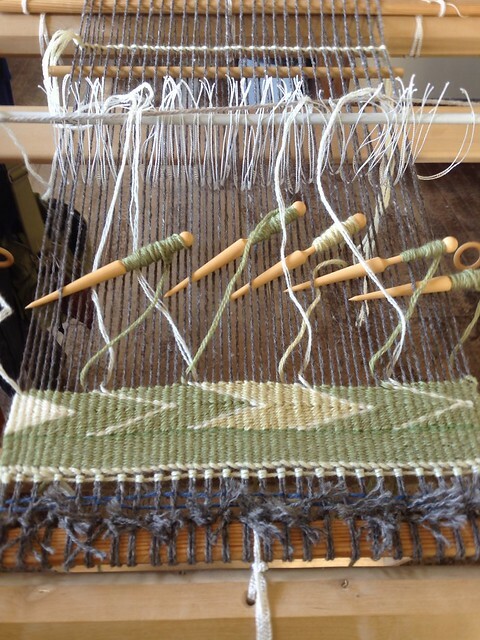 I wove it very quickly on my Ashford Sampleit over the weekend. The Sampleit has proven its worth as a portable loom as I brought it to work on Friday. Several of my coworkers knit or crochet, and now I can weave. The loom tucks into a medium-sized duffle, and I actually warped it and wove a few inches. 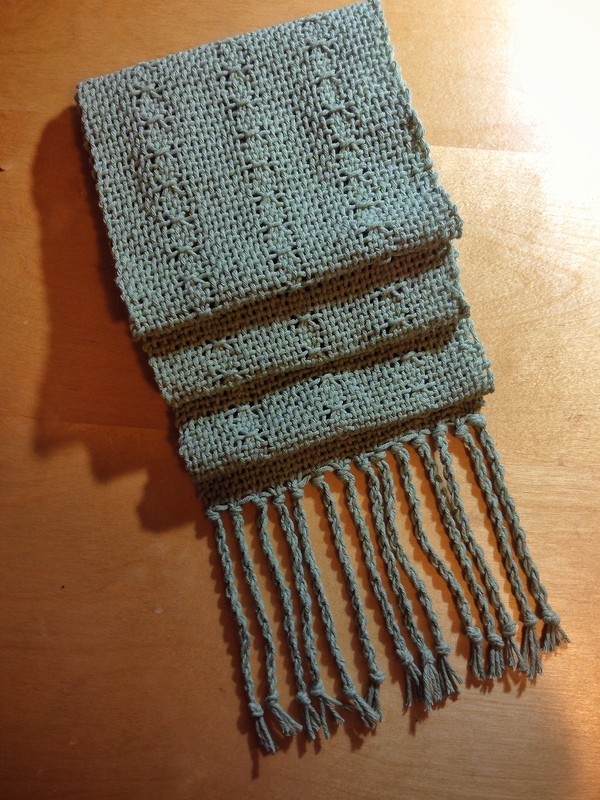 Over the cold weekend, I finished the scarf while under a blanket on the couch. My other looms are getting jealous. This ranks as the warmest scarf I’ve ever made. The brown and natural wool is from my amazing find at Goodwill. 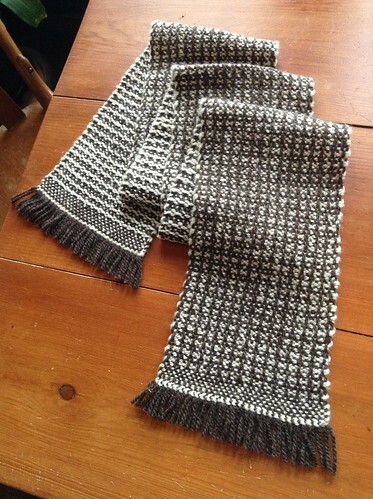 I’ve made three items (this scarf, the triloom blanket, and the triloom bias shawl). Believe it or not, I still have enough for one more project. The brown wool is denser and scratchier than the natural. I don’t mind, but I can’t imagine many people would seek it out. This scarf was warped and woven in one day. 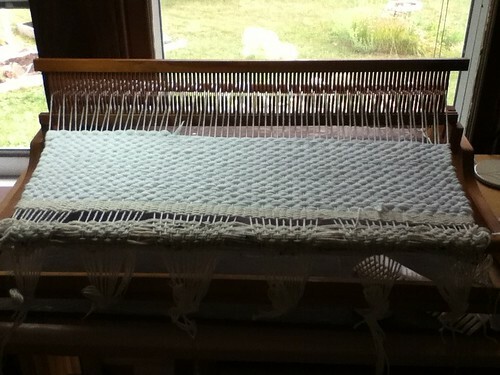 I used a single warp float pickup pattern from Jane Patrick’s book. Because this is wool, I assumed it would shrink, but even in the hottest water, it only lost an inch in width. I suppose that it shrunk more with the open weave of the triloom. The temperature is supposed to be below zero (F) this week, so maybe it’ll be woolen scarf weather, even if it’s a little scratchy.